Map showing many of the wrecks in the Fjords. In the engagements the British won two posthumous V.C.s as they destroyed ten German destroyers and a submarine for the loss of two of their own destroyers and two aircraft. The Norwegian Navy lost two ageing ships and two patrol boats. Over 700 sailors were killed on all sides, and it later came to light, that in the initial torpedo attacks, a German troop ship, carrying 3000 men of the Alpine Division, was sunk drowning all on board. Map showing wrecks in Narvik harbour. At the time of the battle over 25 merchant ships were anchored around Narvik harbour, and many were sunk. These ships, together with all the destroyers, have turned the area around Narvik into a spectacular graveyard of shipwrecks, to which access has only been recently granted. The diving vessell Jane R.
All these wrecks were dived on in September 2004, from the Diving vessel Jane R, skippered by the inimitable Gordon Wadsworth, who is still finding new wrecks. While I was in Narvik I met a great underwater photographer called Frank Bang who has extensively filmed most of the wrecks in the area, and is still adding more. He was very kind to allow me to reproduce several of his photos in the articles below. visit his site Frank Bang’s homepage for more great photos. 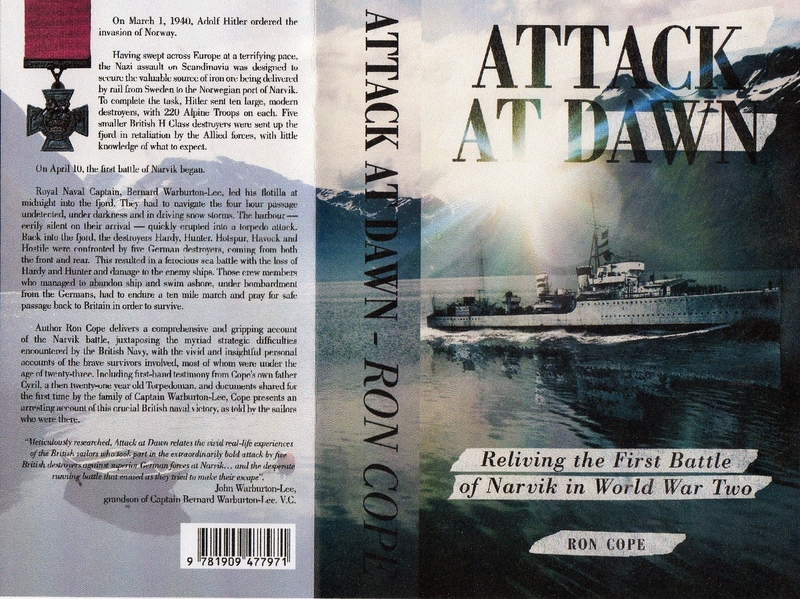 Attack at Dawn: Reliving the First Battle of Narvik in World War Two by Ron Cope (published by Clink Street Publishing RRP £11.99 paperback, RRP £7.99 ebook) is available from 10 April 2015 online from retailers including amazon.co.uk and to order from all good bookstores. RRP £11.99… ISBN:978-1-909477-97-1 Ebook : 978-1-909477-98-8. Three years after his book on the Battle of Narvik, Ron Cope now reveals for the first time the untold story of HMS Hunter and her crew. 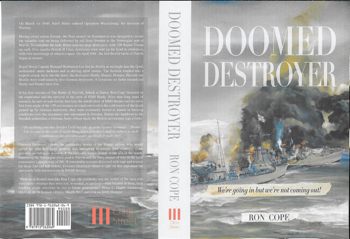 Doomed Destroyer by Ron Cope (published by Clink Street Publishing RRP £12.99 paperback, RRP £4.99 ebook) is available from April 2018 online from retailers including amazon.co.uk and to order from all good bookstores. > I am searching for a particular photograph of Winston Churchill inspecting the survivors of the HMS Hardy on 19 April 1940 at the Horse Guard Parade at Whitehall. I have been successful in obtaining many different photographs of the occasion over the past few months, but not the correct one clearly showing Austin McNamara in the photograph. Austin had been presumed dead in the sinking of the HMS Hardy at Narvik in Norway on 10 April 1940. The local paper boy in Bolton raced around with a copy of the newspaper saying ‘he was alive’. I am trying to get a copy of the right photo for his sister’s 70th birthday in April 2004. Apparently the same photograph appeared on a television documentary at the time as well. I am also trying to get any information pertaining to him or the HMS Hardy or HMS Gould for her. I have hundreds of pages of emails, photos etc if someone would like to have copies of information I have gleaned over the years about HMS HARDY in my search for the photo for my mother in law. My father was on the Hardy (Walter Mitchell known as Mick) and at Trafalgar Square when Winston Churchill was giving his speach. I have a photograph of him and also a Pathe News video of the event. Can I help in any way. I would add to my last that ‘Attack at Dawn’ predominantly focuses on the Crewmen on ‘Hardy’. There is a following book which is about the experiences of the Crewmen on ‘Hunter’. This will be published in summer. Watch this space. I am writing this as I have just finished reading Ron Cope’s excellent book Attack At Dawn. My interest in Narvik is that my grandfather John William McCracken was a Gunner on the HMS Hardy. It was great to see him mentioned and even a photo in the book. Ron if you read this thank you so much for sharing these stories. Sorry for delay in replying but we have spoken since. As you know my second book will feature the ‘Hotspur’, having been in collision with ‘Hunter’ [The Doomed Destroyer] and then escaped down the fjord from the five larger German destroyers. Hopefully the book will be on sale for end of 2016, or shortly after. Those wishing to purchase a copy, similar to ‘Attack at Dawn’ it will be available on ‘Amazon’ and ‘Kindle’ and all good book shops. Greatly appreciated your first book on the battle of Narvik. Any news on your second book ? Just an update about the publishing of “Doomed Destroyer”, it appears I have set ‘Authoright/ Clink Street’ publishers quite a task. As previously mentioned there are almost 200,000 words [in fact brought down from 10,000 more] also 100 photographs, which are from different printing sources / media. Having purchased the original ‘As Fitted’ Admiralty Ships Architect drawing of the ‘H’ Class Destroyer [Infact HMS Hardy] I have enlarged the print to show six sections to allow a Key of140 relevant parts of ship. This could be on seperate pages or produced in a ‘concertina’ type pullout. A first for the publisher. The ‘Front Cover’ for the book has been completed. Watch this space. Ron Cope. Do you have any information about the U-Boat found in a Narvik Fjord? It was shown in the last episode of ‘Finding Hitler’ which is shown on the History Channel. Its located at 150ft depth. It is close to where the Dornier Sea Plane lies.